"Without a detailed career plan you will loose direction!" What Are Your Expectations & Predictions? Which of these do you really think will happen to you? Did you find this exercise easy or difficult? Why? Do you think you are being realistic with your answers to these questions? Have you left too much to chance, or do your answers show some definite thought on your future? In making any important decision, there needs to be some weighing up of what is happening with you now, with what your plans are for the future. For each really big decision you make, there would be some trade-off between what is to be lost and what can be gained. If your present comfort or security is your only consideration, you could easily fail to achieve what you really want from life. For example, to undertake a full-time course of study for four years means giving up a full-time salary for that time in the hope of getting some long-term benefit. However, it may not be possible to take on full-time study if you don’t have or can’t get enough money to live on. The future may be unknown, but it still affects the choices and decisions which we make. What goals do I have? What dreams have I got? What type of life would I like to lead? When would I like to get married? How many children would I like to have? What would I like to be well known for? What standard of living would I like? What education level would I like to reach? Where would I like to travel to? In what ways can I grow as a person? What steps am I taking now to achieve the future I want? It is very possible that other people have some hopes and plans for YOUR future. What hopes, plans, expectations do you think these people have for you? What effect do they have on your expectations and plans? 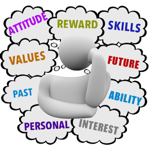 When thinking about your life right now, or at ANY other time in your future, the factors listed below (there are many others as well) are likely to influence your decision. Can you explain how each one might have an effect on your decision making? You might be able to help these people out?